As a series of intergovernmental panels and the March 15 global wave of student strikes remind us, the environmental crisis is no longer a thing of the future. It is our here and now, exacting a toll on the world’s citizens of shocking proportions. Against a backdrop of catastrophic droughts, forest fires, and abnormally intense hurricanes and heat waves, the arguments of climate change deniers seem ever more absurd, as does the view that human activity is not the major contributor to a warming earth. Today, sixty-nine percent of Americans are “somewhat worried” or “very worried” about climate change, according to late-2018 surveys conducted independently by Yale and George Mason Universities. This percentage represents the highest level recorded since these surveys were first fielded back in 2008. Gratifyingly, with grassroots activism serving as a key factor in the election of numerous left-of-center Democrats and even democratic socialists to Congress in the 2018 midterms, policy prescriptions for addressing the crisis are at last garnering serious attention in Washington. Multiple approaches have been put forward, but perhaps the most progressive framework and that receiving the most attention is the one embodied in the Green New Deal resolution recently introduced by Representative Alexandria Ocasio-Cortez (D-NY and a democratic socialist) and Senator Edward Markey (D-MA). Importantly, this effort is non-binding, ideally representing only the opening skirmish in an ongoing two-year effort to translate resolution goals into specific legislative items. Passing such legislation will, of course, also require continued grassroots organizing and public education at the local level, thereby increasing the odds that a more amenable Congress will be elected in 2020 and that those elected will not buckle to counterpressure from the fossil fuel industry and its allies, as well as from right-wing “anti-big government” factions. 7) inclusive collaboration, partnership and consultation with impacted communities, labor unions, worker cooperatives, civil society groups, academics, scientists and businesses in the elaboration of specific transition strategies. While analysts on the right have already lambasted this approach, several economists have cited the Great Depression-era Reconstruction Finance Corporation (RFC) as a publicly-owned credit machine that allowed the financing of the New Deal and World War II without recourse to additional tax burdens on the citizenry. Furthermore, the possibility of hyperinflation that has sometimes accompanied “money-printing” by federal governments is usually only a problem in countries where foreign debt service mechanisms have collapsed under unusual societal strains like war. Other economists remind us that in the Eisenhower years—a period of remarkable economic growth—top-end marginal tax rates were 91%. Today, they are 37%. Clearly there is room for the wealthy to put an increased portion of their riches towards the good work of cleaning up the earth, not least because fossil fuels have been and continue to be an important component of their portfolios. No matter how it might be paid for, support for the Green New Deal is growing in Washington. Perhaps suggesting the rising influence of progressive factions within the base of the Democratic Party, all ten of the current crop of Democratic presidential contenders have been very public in their endorsement of the resolution. Twelve Democratic senators have signed on as co-sponsors, as have 90 Congressional representatives. Yet Senator Klobuchar, a co-sponsor, has pointedly observed that the resolution is merely aspirational and that possible technical concerns may mean a 2030 deadline for implementation is problematic. In short, politicians alone cannot be trusted to move forward with all due haste in the fight against climate change. All of which brings us back to the global student strikes and similar actions by activists like the young people involved in the U.S.-based Sunrise Movement. 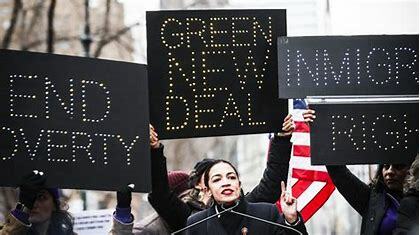 The movement is notable for its organization of sit-in protests at the offices of Nancy Pelosi to secure the creation of a Select House Committee on Climate Change and its drafting of many of the provisions ultimately incorporated in the Green New Deal resolution. Activists also visit legislators and candidate offices to get them to sign a pledge vowing not to accept contributions from the fossil fuel industry. Most recently, Sunrise has also announced an ambitious plan to hold leadership trainings for environmental activists throughout the country in the coming period. 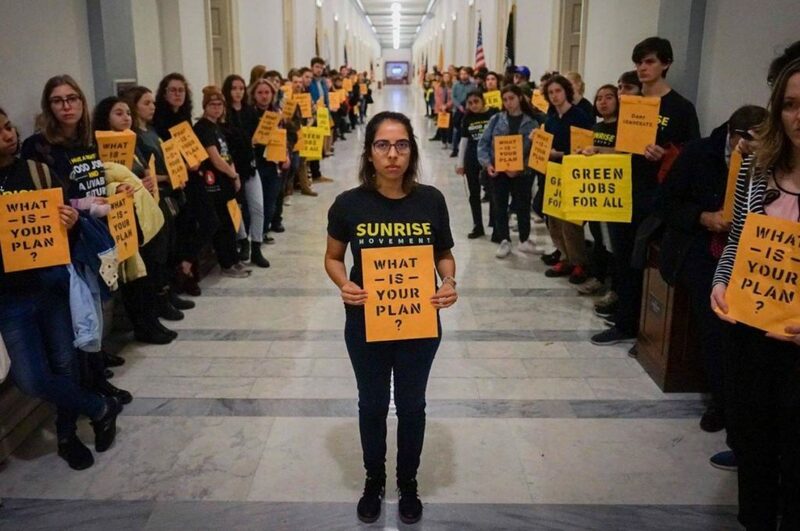 Nor is Sunrise alone in its efforts, groups from Bill McKibben’s 350.org and the venerable Sierra Club are all directing new resources to local organizing and public education around the Green New Deal. Altogether an impressive and growing roster of 217 environmental, religious, civic and community groups have endorsed the resolution. Unions and related worker-rights organizations have also come forward to support the resolution, notably SEIU’s District 1199 and Local 32BJ. But despite inclusion in the resolution of “just transition” provisions to address the needs of workers dislocated due to the elimination of fossil fuels, labor has been slow to jump on the bandwagon. In part, this is because decision-making processes in unions, often multi-layered and complex, can be slow in coming to resolution on matters of public policy. 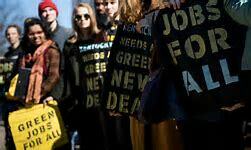 Additionally, although highly supportive of the Green New Deal, the Labor Network for Sustainability has itself criticized the resolution for not including in the resolution a provision protecting the right to organize. Hopefully such a provision will eventually be included, given that labor is identified as a key collaborative constituency and will be at the table when resolution goals are translated into specific legislative proposals. In the meantime, in our unions, in our places of worship, in our community groups, let’s step up for a Green New Deal. We have already seen the future; it is upon us and inaction only makes for grimmer—much, much grimmer—prospects. This entry was posted in Environment, labor. Bookmark the permalink.